"Lovely man, sorted our problem in no time at all. Would recommend to anyone. Will definitely use again if need be." 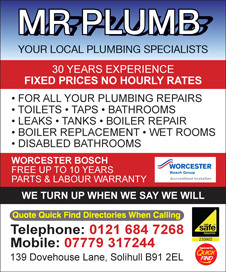 "Excellent customer care, will definatley use again"
"Called Mr Plumb out he came out straight away, did the job there and then very clean and tidy . will without doubt use his service again just cant thank him enough." "The quality of work is great,I found it value for money and wouldn't hesitate to recommend them." "Very good and efficient and very reliable will be using this company again." "I used this company and so did my daughter who they fitted a new boiler for .she was very pleased that I recommended them will be calling them again."